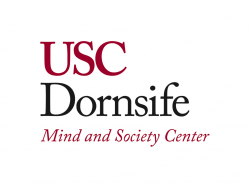 The USC Dornsife Mind & Society Center opened in August 2014 in the new Dr. Verna and Peter Dauterive Hall, an interdisciplinary social sciences building. Our research addresses the interface of individual and society by investigating how people think about societal issues and how societal context shapes individuals' thoughts and actions. Understanding this interface requires insight into the context sensitivity of basic cognitive and affective processes, which we study in laboratory experiments and social surveys, and their real-world implications, which we study through field experiments and controlled interventions.